Most people know what wind turbines look like on the outside: huge, white, spinning giants. But how do they look on the inside, and what's it like to climb one and stand on top? Sally Wright knows because she's been there, done that, and says it's one of the best parts of her job. She's the principal wind turbine engineer at DNV GL, an international company based in Norway that's dedicated to "safeguarding life, property and the environment," according to the company website. Wright, who's in her early fifties, conducts inspections for prospective wind-farm buyers and for owners with faulty turbines. Although she works from her home office in Greenfield, Mass., 10 miles south of the Vermont border, she has inspected Vermont turbines and will likely do so in the future. 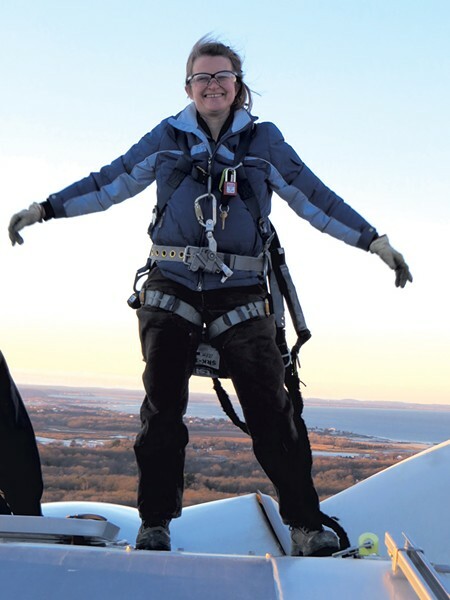 Armed with a master's degree in mechanical engineering, Wright has worked in wind power since 2001, when the fledgling industry "had a lot of potential and was trying to find its way," she said. She's seen it grow exponentially and points out that the U.S. now has more wind than hydro capacity. "It's not called 'alternative' energy anymore," Wright noted. This engineer loves working in clean energy — whether at the office or strapped into a harness 100 meters in the air. SEVEN DAYS: How did you get into this field, or this work specifically with wind turbines? SALLY WRIGHT: I went back to [engineering] grad school with a fairly vague idea that I wanted to work in clean energy. I did some volunteering at the University of Massachusetts, helping them out with this prototype wind turbine that had been given to the university to modify and use in experiments. You can still see it as you're driving [north] on Route 91 near Holyoke. [Later,] I had been working for [a] steam turbine company for seven years, and one day I got a call [from Jim Manwell at the UMass Renewable Energy Research Lab]: "Sally, do you want to work in wind power?" I finished off my steam turbine job and jumped into wind power. SD: What percentage of your work involves climbing up inside the wind turbines? SW: Not a large percentage. Most of the time, I'm at my desk. I just never post pictures of me sitting at my desk — it's not very interesting. [Laughs.] Maybe I climb 10 machines a year. SW: I get to work with smart people, solving interesting problems that have a real impact on the global wind industry by finding ways to provide better-quality, higher-reliability machines. And I just love getting up in wind turbines. It's such a cool environment. You climb up this long, long tube with lots of platforms on the way. And then, [near] the top, there's what's called the nacelle, [which] is a little like a van or a truck with a big generator in the middle of it. And then there's usually a hatch on the top, and you go out the top and it's just a fabulous view. I also love seeing the blades. They're so graceful. The fact that they're aerodynamic surfaces makes for very beautiful curves. SD: How big are the blades? SW: [One is] more than half the length of a football or soccer field. The end is a big, round circle, and you can easily walk in it, standing upright. It's a big, cavernous space that pretty quickly gets smaller and smaller and smaller; by the time you're maybe a third of the way into it, you might be crawling. SD: What does it sound like when you're at the top? SW: It's usually pretty windy. [Laughs.] Since it's not running [when I'm up there], you don't have machine sounds. When you're inside the tower, you're inside a huge metal tube, so it's very echoey. Maybe you climb up one section and you stand on the platform, and there will be several people. You can't really hear them unless you're facing them directly. SD: Do you remember when you first started climbing turbines? Did you have to build up some stamina? SW: Well, when I first climbed, it was a prototype and it was just 80 feet. One time — oh, man, I'll always remember this — I was climbing in Oklahoma, and it was over 100 degrees, and you're inside a metal tower in the sun. It was really uncomfortable. I felt bad when I got to the top. I had to sit down and put my head between my knees. The heat is hard, as well as the extreme cold, like Ontario in January. SD: At the top, do they sway in the wind? SW: Oh, yeah. They sway — like being in a boat, except it's swaying more side to side. SD: In terms of energy issues in the country and around the world, where does wind fit in? SW: Wind, even 15 years ago, could have been thought of as a minor player. [Now,] it provides a significant portion of our country's energy. We now have a larger capacity of wind power in our country than hydro, and hydro [has] been one of the things that's allowed us to get out of nuclear in terms of capacity. 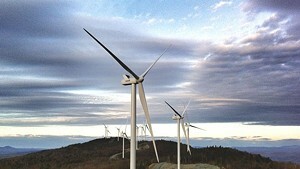 There are parts of the country that get a very significant portion of their energy [from wind]. So it's still growing. SD: From 2001 to now, have you seen changes in the numbers of women involved in the field? SW: As the industry has gotten bigger, I see more women, but I'm not sure it's a higher percentage. I work in a larger [group], so I have women on my team now, which is great. I much prefer having diversity and would love to have had better role models and more of the sense of companionship that goes with diversity. When I'm out in the field, it's very rare. There'll be administrators and engineers on-site who are women, but only once have I ever run into a woman technician in the field, and that was in China. SD: What advice would you give other women who think that your job sounds intriguing? SW: Go for it! Why not? You have [a valuable perspective] to offer. The original print version of this article was headlined "Climbing to the Top"